Little Tomato's big Christmas gift this year was a 'labor of love' from mom. The project is essentially a PVC pipe frame which is 5'-6" x 5'-6" in size with a fleece sleeve which slips over the frame. The sleeve has appliqued scenes on both sides which were made to be interactive. The tree has velcro attachments which allow three-dimensional felt apples to be picked from the tree. I will also be making lemons and oranges to attach in the future. The vine has velcro attachments which allow three-dimensional felt tomatoes to be picked from the vine. I will also be making eggplant and cucumbers to attach in the future. The corn stalk husks are pockets for corn cobs. I have not been happy with my attempts at making the corn out of felt, so I plan on purchasing this fabulous pattern... and learning how to crochet in the process!! Part 2 of this project (I ran out of time before Christmas!) will be to create dirt rows to lay in front of the garden for root vegetables. I found some great examples here and here to use as a guide. We hope this will plant the love of gardening into our little girl before spring, so she will be a seasoned pro in the garden next year! The pond has a pocket in the water to place fish. Pillow logs and flame were made to place in front of the nighttime scene for a campfire. Part 2 of this project will be felt marshmallows with holes in the center to place on dowels for roasting and felt chocolate bars and graham crackers to make the perfect mess-free smores! Next year, we plan on including the little one on our camping adventures, so during the cold winter months we will have plenty of practice telling fireside tales and snuggling under a blanket at her pretend campsite! 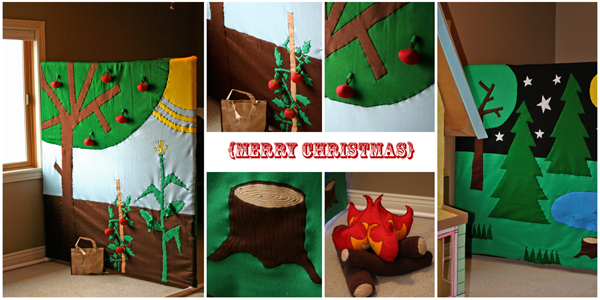 I am going to show this to Mr.MBL, and see if he can help me make something like this for the playroom. So cool.